You can import our SFF calendars or subscribe to other calendars, including getting calendars from other programs when you import iCal calendars into Outlook.com. You can import events from an .ics file to your existing calendar or subscribe to a calendar online and receive automatic updates (known as an ICS subscription or an iCal subscription). You can import calendars from websites or calendar programs that support the .ics file format, such as Apple iCal, Google Calendar, and Mozilla Lightning. Click here to get our SFF iCal. This file will work on your iPhone, your PC using Outlook, Gmail and many more. You can search the Internet for lists of iCals, such as those found at iCalShare.com. Websites for theaters, sports teams, and schools often have an “Add to calendar” link that you can use to download an iCal. 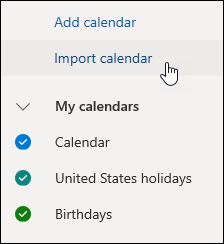 Bing also has suggestions for calendars in Outlook.com. 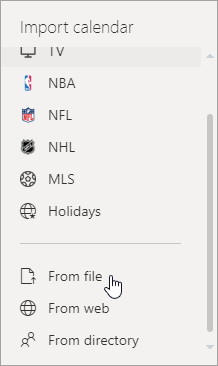 In classic Outlook.com, select Interesting calendars in the Calendar navigation bar. In the new Outlook.com, select Discover calendars in in the left pane. Note: Microsoft isn’t responsible for the accuracy or content of any third-party calendars. We recommend that you review the terms and conditions before importing or subscribing to any third-party calendars. Note: When you import an .ics file, your calendar doesn’t refresh the imported events, even if the calendar’s owner makes an update. When you import an .ics file, you get a snapshot of the events in the calendar at the time of import. Your calendar doesn’t refresh the imported events automatically — even if the calendar’s owner makes an update. This is a good way to add events to your existing calendar that aren’t going to change, like tide tables or phases of the moon. Subscribing to an iCal online calendar connects it to your calendar. Whenever the owner of an iCal you’ve subscribed to makes changes to the events, Outlook.com updates your calendar. This is a good way to track events that change frequently, like movie times or a school calendar.